Allen W. Seaby was a student at Reading University where he developed a lifelong passion for colour woodblock printing in the Japanese style. He has published on a range of subjects, including art history and technique as well as children’s literature. Seaby taught fine art at Reading University for many years, eventually becoming a professor and head of department. His illustrations are well-known to post-war British children through his watercolours for Ladybird Books and books on British birds. 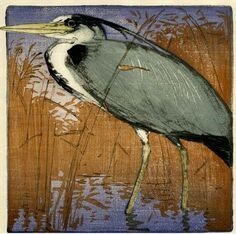 Martin Andrews came to Charlbury Art Society three years ago to give a talk about the artist and printmaker Rena Gardiner. Martin lectures in Typography and Graphic Communication at Reading University. All welcome. Non-members pay £3 entry.